Rain. We are having rain. The much needed rain has finally arrived and we are loving it. The hills are slowly putting on their green winter coats, lawns sparkle emerald green, and it is time to check on the river and the waterfowl. The river carries a lot of water. It has changed from a comparatively gentle waterway to a rushing torrent, complete with the appropriate noise. 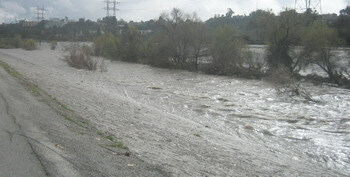 The Los Angeles River roars. One should assume that the mallards and all the other birds are loving it. But actually – they don’t. They are hanging out up and down the banks of the river, looking slightly puzzled. Their islands are flooded, the current is too swift to keep up with. Any bird brave enough to hop into the water gets carried away at an unprecedented pace. The only ones to get their feet wet are the black-necked stilts. I swear, they are looking quite smug. Right, they seem to be saying, you lot are always snickering at us because we prefer wading to swimming. With our long legs we can still wade. Can you swim? Glad you’re getting some rain to keep the fires in check. You have no idea how glad we are. The last three years were so terribly dry – I celebrate every drop of rain. The nice thing is, the rainy season lasts only three months. But if we do not get enough water here during that time (and not enough snow in Northern California), then things are looking bleak the rest of the year. Wonderful long summers are no fun when one has to worry about water. By the way – are you feeling better? At least a bit? Yeah, a little bit better. I still wear out easily. But I am improving. Thanks for asking.